, which contains everything you need to give nest recording a go in your garden or local green space. Then, if you decide to take up the survey, just return the enclosed registration form and we'll send you a NRS Starter Pack containing the full set of survey materials and further guidance on getting started. The Quickstart Guide is a simple introduction for those who want to give nest recording a try. However, if you already know you'd like to take part in the survey, we can send you the more comprehensive NRS Starter Pack straight away. This is recommended if you already have plans such as a nest box monitoring project, or if you will be focusing on more specialist species such as waders. Please download and complete a registration form. If you do not have access to a printer then nrs [at] bto.org (subject: Full%20Starter%20Pack%20Request%20(please%20include%20your%20address)) (email us) to request a form to be posted. Monitoring a specially protected species? Although nests of all wild birds can be recorded for NRS, some species are specially protected, including Barn Owl, Kingfisher and Little Tern—a full list is here. If you want to monitor a specially protected species for NRS, you must first obtain a licence/permit in addition to registering with the survey. Please visit the Protected Birds page for more information. Here is a list of what's in a starter pack. You can download PDF copies of the items by right-clicking the links. 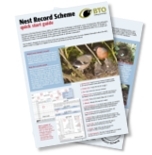 Required reading for nest recorders, this 27-page booklet explains how to inspect and monitor nests and how to complete nest records according to the NRS methodology. It includes the Code of Conduct, which all nest recorders are required to follow. This is your nest recorder 'ID', for putting on any nest records you send us. It saves you having to write out your full name every time! Over 70% of nest recorders now use the free recording software Integrated Population Monitoring Recorder instead of paper cards. Pocket-sized for use in the field, this reference card lists all habitat and status codes. 30 nest record cards are included in the starter pack and they are available free on request. Please complete this sheet and enclose it whenever you send in nest record cards. Posted to nest recorders every March and September, this newsletter for nest recorders and ringers contains news, survey results, and articles by volunteers. A promotional leaflet for passing on to anyone who is interested in the Nest Record Scheme. The leaflet is particularly handy when talking to landowners and people you meet in the field. More copies are available on request. 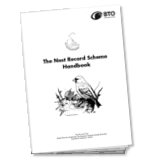 The new BTO book a Field Guide to Monitoring Nests. For details on this and other useful publications, please see the publications page. Contact a mentor for help getting started. Training courses on nest finding, each May and June. These are Ideal for beginners and more seasoned nest recorders alike. NRS priority species list. These are species for which we are most in need of more records. Lifecycle (previously NRS News), which is sent out to ringers and nest recorders every Spring and Autumn. NRS Yahoo Forum, an online mailing list where nest recorders from across the country share information, ask advice, and generally chatting about nest recording! nrs [at] bto.org (Email us) or phone 01842 750 050. We're always happy to give help and guidance.